Last weekend was great: I went to see Avengers on Friday with a friend who hadn’t seen it yet, went to the Brooklyn Flea with the same friend on Saturday, and spent the rest of the weekend hiding in air conditioning and quilting. My family was out of town, so I had the house more or less to myself. I’m almost done with the Circa 1934 Filmstrip quilt: all I have to do is sew down the binding. This may take me a while, though, because I’ve decided I want to do it by hand, and I’m terribly slow at sewing by hand. 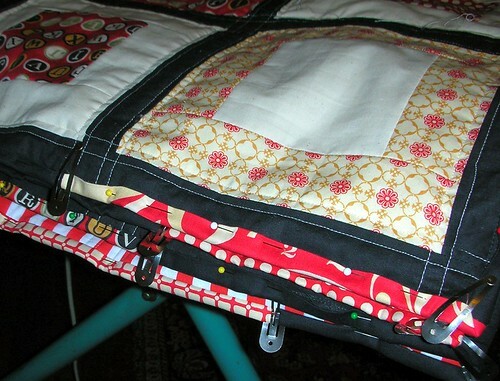 I made it a scrappy binding, alternating black fabric with strips of the various prints used in the front of the quilt: I had just enough to make it work, with hardly anything left over at the end. I also cut fabric for my next project — a Kitchen Window quilt. Because I don’t have enough half-done projects already, right? But I know myself well enough by now to know that I’ll pretty much always have more than one WiP at a time: I do it with knitting, with spinning, even with reading books: I like to have a variety to flip back and forth between. I’m torn right now between using a black fabric for the frame and using a navy one — I’ll have to lay them both out for a little bit and look at them in different light, I think. The sashing between windows will be a deep green to pick up some of the teals and greens in the panes. How were your weekends? Anything out of the ordinary, or interesting projects? And keep an eye out for the Let’s Get Aquainted blog hop posts this week: there are three on Tuesday this week! I always have so many WIPs. I don’t know what I would do if I ever finished them all! The Filmstrip quilt is beautiful! I love scrappy binding. 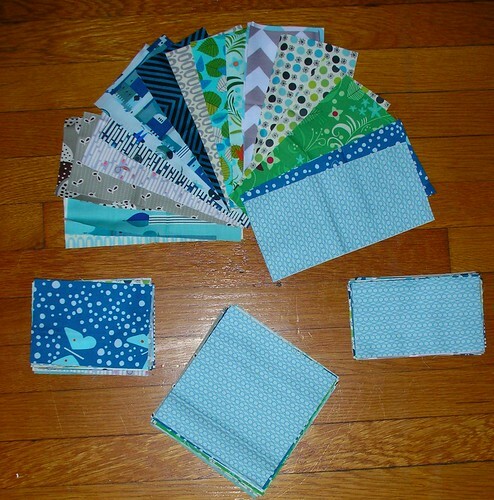 I also love the colors you chose for your Kitchen Window Quilt. I’ve never used black for sashing a quilt (though I want to get brave enough to try it), but I’ve really loved a few modern quilts I’ve seen recently with black accents or sashing. Your filmstrip quilt looks fantastic! I really like what you are doing with the binding. 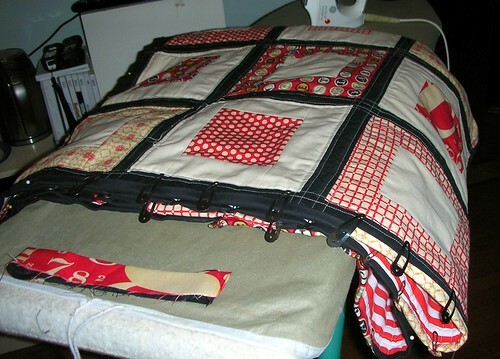 Love the filmstrip quilt – it looks great! Great choice of prints and colours for the kitchen window quilt too. Previous Previous post: Circa 1934 meets Filmstrip.